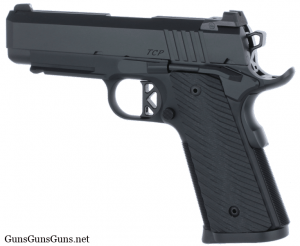 Summary: The description, specs, photos and pricing of the Dan Wesson TCP pistol. 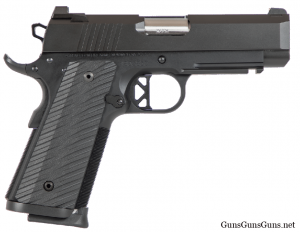 The Dan Wesson TCP is a 1911-style pistol built on a forged aluminum frame with a commander-length stainless steel slide, and chambered in .45 ACP or 9mm. “TCP” is short for Tactical Commander Pistol. The TCP from the right. .45 ACP, 9mm 8+1 7.64″ 4.25″ 1.25″ 5.6″ 32 oz. The TCP from the left. This entry was posted in .45 ACP, $1,501-$1,750, 1911, 9mm, Dan Wesson, Full size, Semiauto on January 29, 2019 by Staff.